Campaign resources are available at cost to candidates participating in a Fiesta Especial Royal Court campaign. Facebook Cover Photo and a electronic flier is available at no cost. Candidates may purchase promotional items for their campaigns including Post Cards, Business Cards, Pins, Buttons, Fliers and more. All campaign materials that feature the name "Fiesta Especial" must be approved before use by each candidate. For the 2012 Campaign, Clark H.S. Students, Chelsea Figueroa and Tristan Gentry, set up a Go Fund Me accounts promoting their campaigns and asked friends and family to make donations to help them win. Chelsea and Tristan ended up being Fiesta Especial Queen and King! This is a great tool for for profit organizations to use when trying to get a tax deduction for their donors who give to the candidate's campaign. By selecting Reaching Maximum Independence as the charitable recipient of all funds raised, your supporters can claim their "votes" as a tax deductible gift. All funds received before the deadline will be credited to your candidate's campaign. Please note that processing fees are deducted and are not included when calculating the total amount received from this resource. Request a weeknight (Monday-Friday) event for your non-profit organization online or by contacting one of our fundraising agents at 888-CEC-4FUN. Three week advance notice from date of booking is required. Only authorized personnel with the organization should request the event. To be eligible, non-profit organizations must have over 75 participants and directly benefit children’s causes up to the age of 12 and must provide a copy of their 501(c)3, W-9, and a summary of your organizations goals and objectives. To be eligible, for schools, only authorized school personnel or PTA/PTO representatives can officially book events. You must be a non-profit public or private pre-school or elementary school with 75 or more students to be eligible. Only one fundraising event is available for booking per month per location. Chuck E. Cheese supplies great online tools to help you promote your fundraiser. Have fun knowing that 15% of all sales generated from your participating friends and family will be donated back to your organization. This includes all food, merchandise, and token deals purchased through the registers. Your donation check, in the name of the organization, will be sent to your event organizer within 10 business days. To benefit Fiesta Especial, click on the "Royal Court Fundraiser" Party to order. You will be responsible for shipping fees. Organizations wanting to host a party to benefit their Royal Court Candidate can call the consultant below to set up their own party. Online orders are responsible for their own shipping, however phone in orders and fundraising packet orders have complimentary shipping with a $150.00 order. Melissa will donate 25% of sales toward your candidate's campaign for the Fiesta Especial Royal Court. There are a number of restaurants and business out there who will host an Eat-4-A-Cause or a Shop-4-A-Cause event to help you raise funds for your candidate. In the event that you are a for profit organization, you may elect to have funds benefit Reaching Maximum Independence, Inc. and all funds received prior to the deadline will be credited to your candidate's campaign. Some restaurant ideas are: Ruby Tuesdays, California Pizza Kitchen, Fish City Grill, Cici's Pizza, EZ's, Sweet Cece's Frozen Yogurt (20%), Piranha Killer Sushi, Taco Cabana, Joe's Crab Shack (River Location). 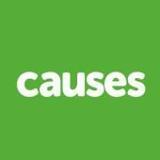 Causes is a free online platform that provides easy-to-use tools for driving change. We help passionate people share ideas, find supporters, raise money, and make an impact. Causes is a value-add to your social media strategy, giving your Facebook fans and Twitter followers a destination to engage with your mission. When one of your supporters takes an action on your cause, they are asked to invite their friends and is posted on their Facebook Timeline. Every action is easy to share and email, increasing your campaign's chances of going viral. Your organization has the ability to create custom fundraising projects with donor choices, videos, photos, and more. In addition to your own fundraisers, affiliate causes that support your organization can create their own fundraisers expanding your brand to new constituents.